For the vast majority of their cricket history, India were used to the presence of obdurate openers who blunted the new ball with great tenacity. However, in terms of taking the attack to the opposition, there were few and far in between. 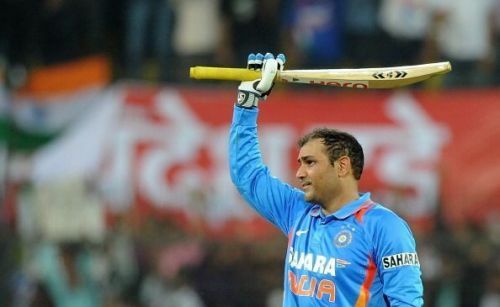 It all changed when Virender Sehwag was vaulted to the top of the order. With his devil-may-care attitude and buccaneering approach to batting, he triggered a massive revolution in the purest format of the game. Often shaping the direction of Test matches within a matter of sessions, Sehwag enthralled spectators with his enviable quiver of shots and enabled India to enforce results on the flattest of pitches. In the 50-over format, his blistering starts became an integral part of a formidable Indian lineup which surged to World Cup glory in 2011. Despite being retired from the game, the 'Nawab of Najafgarh' continues to entertain the audience with his hilarious posts on Twitter. Gleaning inputs from the different stages of his playing career and beyond, here are five fascinating life lessons we can all learn from Sehwag's evolution as an entertainer par excellence. At the first instance of Sehwag, the cricket world remembers his spell-bounding stint as an opener. However, he began his career as an off-spin all-rounder who was entrusted with swelling totals from lower down the order. His inaugural moment of reckoning came during the 2001 Bangalore ODI against the intimidating Australian outfit. A rapid half-century as well as a three-wicket haul enabled him to gain his maiden 'Man of the Match' award. With the experienced Sachin Tendulkar ruled out due to a foot injury, skipper Sourav Ganguly instructed Sehwag to open the innings alongside him during the ninth match of the 2001 Coco Cola Cup in Sri Lanka. Seizing the opportunity, the right-hander hammered a 70-ball century against New Zealand to set up a facile victory for India. Although he was moved back to the middle-order, the team management took note of his skills as an opener. During the 2002 tour of England, Sehwag was promoted as a makeshift opener. He responded by scoring a stellar century at Trent Bridge and went on to make the position his own across both formats. The manner in which Sehwag immediately availed the opportunities to open the innings in both Tests and ODIs offers a case-study in grasping chances. One can never surmise when a life-changing opportunity comes his way. However, as the Delhi dasher showed, it is imperative to keep an eye out for such a pivotal moment. When the window of opening comes, seizing the situation can alter the course of a journey.